Having just returned from a great work-cation at this year’s SPX (selling my comics to a comics-thirsty public and then drinking wine like a wine-thirsty Bacchus), all I can think about right now is the self-publishing scene. And also not being on my feet all weekend. Not standing AND the self-publishing scene. We are in the midst of an interesting and important moment in the history of comics. While the big publishers (DC, Marvel, and to a lesser extend Dark Horse) still wield tremendous power and influence, smaller players (Fantagraphics, Top Shelf, and Drawn & Quarterly) have carved out sizable niches in the marketplace. At the same time, newer and smaller small-press publishers like Secret Acres and Koyama Press are making names for themselves. Meanwhile book publishers have begun to dip their toes into the comics-publishing world as well. Some, like Roaring Brook Press and Lerner Publishing Group, have even created their own comics imprints (First Second and Graphic Universe respectively). And yet, in addition to all of these different avenues for comics publication, their remains one more path; one that is wholly unique to comics: Do It Yourself self-publishing. In the world of prose and poetry, self publishing is looked upon as the last avenue of the un-publishable crackpot (having worked in publishing, I can tell you that every self-published book that we got WAS from an un-publishable crackpot). However, at this moment in comics, self publishing is very well regarded. Publishers and editors attend many of the larger small-press and indie comics conventions (in particular the MoCCA Comics Fest and SPX, though I see the boys from Secret Acres at nearly every show I attend) looking for new creators. At this year’s MoCCA Comics Fest, for example, an artist beside me was offered illustration work from an editor at First Second after someone she knew had seen his work and recommended that she have a look. My point is, and I do plan on making it eventually (I like words…), that in comics self publishing is an important first step for many independent cartoonists. However, not everyone agrees that self-publishing is the way to go. Enter Slow Wave author Jesse Reklaw and his minicomic N.Y.D.I. #1: A History in Publishing. N.Y.D.I., which stands for “No, You Do It” is a counterpoint to the DYI self-publishing movement. Reklaw recounts his years of experience self-publishing and how he came to the realization that it wasn’t for him. 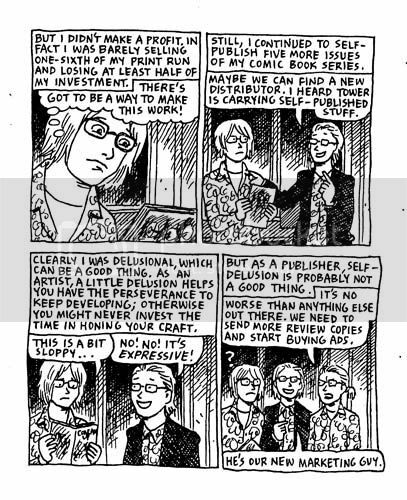 His comic is very frank and straightforward, and is in many ways a primer on what a self-publisher can expect to run into. As one myself, I found myself nodding with agreement as he led me step by step to the uncomfortable conclusion that self-publishing might be more trouble than it’s worth. However, I do feel that he is omitting some of the realities of publishing comics; not the least of which is that if you are just starting out, no one else is likely to publish you. D.I.Y. self-publishing may not be a sustainable business model for most people, true, but if one approaches it less as a business and more as a way to improve artistically AND to get your name out into the comics world, then it is still a worthwhile endeavor. You just have to accept that you will be loosing money in the short term, and gamble that it will pay off in the long term with a publisher seeing your work and deciding to take a chance on you. This is essentially what has happened to Reklaw. His experience self-publishing taught him lessons that he would later call upon when dealing with publishers, agents, marketers, and so on. As he says near this comics’ close: “I know that I’ll always be on the fringe of the publishing world, but it doesn’t mean I have to struggle alone. I just need to find the right publisher, designer, agent, and marketing people to work with. Easier than doing it all myself, I guess.” Which is true, certainly; but in order to get there, in order to find those kindred spirits, most of us will have to self-publish first, at least for a little while. Morgan Pielli is the author of Indestructible Universe Quarterly.